Stands in the centre of the Place Charles de Gaulle (Place de l’Étoile). 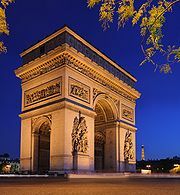 Located at the western end of the Champs-Élysées, 8th arrondissement. Built in 1806 after the victory at Austerlitz by Emperor Napoleon. Beneath the Arc is the Tomb of the Unknown Soldier from the First World War.